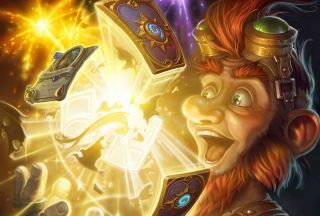 Blizzard's Hearthstone teases continued today with a very brief video posted on the official Twitter account, and viewable below, which hints at something big in the works—possibly an entirely new game mode. The video—actually an animated GIF—consists of a fourth button magically appearing below the three current options: Play, Solo Adventures, and The Arena. Unfortunately, it doesn't bear any kind of label, and that's led to all sorts of speculation on Reddit and Facebook about what's coming. The foremost hope seems to be for a new game mode, perhaps 2v2 or a tournament mode, but it could also be a new stat tracker or achievement list, which the game has thus far been sorely lacking. The mystery, whatever it is, will likely be revealed soon enough, perhaps within the next day or so: Remember that Blizzard waited just 24 hours before revealing that last week's "mysterious patron" tease was for alternate class heroes, beginning with Magni Bronzebeard as a stand-in for Garrosh Hellscream. We'll keep you posted.